Abstract: Illicit drug use by teenagers and young adults continues to increase in the United States. Drug abuse is costly to our nation, exacting more than $700 billion annually in costs related to crime, lost work productivity, and health care. At the same time, many forensic laboratories are experiencing increased workloads and reduced resources. There is an immediate need for high throughput methods resulting in conclusive identification of controlled substances such as opiates, barbiturates, and amines. In this study, preparation and analysis times were significantly reduced without sacrificing thorough characterization of samples. 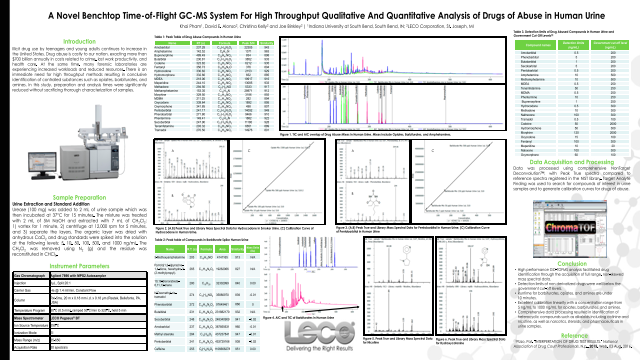 Summary: -High performance GC-TOFMS analysis facilitated drug identification through the acquisition of full range, non-skewed mass spectral data. -Detection limits of non-derivatized drugs were well below the government cut-off levels. -Runtime for barbiturates, opiates, and amines are under 10 minutes.